Who does not like a well-kept glossy full-grown beard and it is proved now that women prefer men with beards. But, we all know how demanding the process is and when you are a black man the process gets doubly challenging. This challenge stems from the fact that generally, the beard hairs are thicker than your head hairs and as an average black man you are more than likely to have curly hair. So, to come up with a head-turning beautiful beard you need to find a way to balance out these two factors; thicker and curly hair and for that. 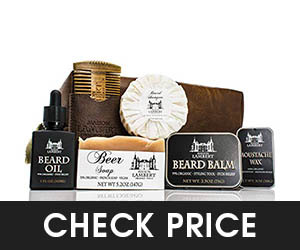 For this, you need to have your special beard grooming kit and this kit includes a number of products. As stated earlier, growing a beard for black men is a real task because of the coarse and thicker hair texture and a greater tendency to develop ingrown hair. To cover this, whenever going for beard products for black men you should look for ingredients and properties that will take care of these points. Therefore, we have reviewed some of the best beard products for black men the market has to offer. Most of the beard shampoos are used to clean the beard. However, what comes as a side effect to this process is that it devoids the hair of their natural moisture and makes them dry and brittle. For black men, keeping the moisture is vitally important to growing well-nourished hair because of their already dry skin and hair texture. When you have coarse and curly hair, sebum, the natural oil produced by the skin, does not travel all the way up. In other words, as black men, your hairs already are relatively less moisturized as compared to white men or Asian men. Seven Potions have made a name for themselves in beard products in a very short time and they are producing a whole range of beard products. 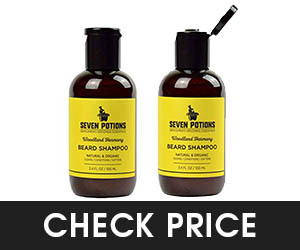 You would be thinking what makes Seven Potions Woodland Harmony beard shampoo to be on our list – its ability to replenish your natural sebum oils. Therefore, not only it rinses and cleans your hair, but it also moisturizes your facial hair. Above all, what I love about this beard shampoo is the fact that it has no additives and it is 95% natural. Moreover, it is organic and vegan. Its all-natural fragrance is made of essential oils. The sweet woody smell is not too strong and is really subtle and does not interfere with your perfume. In this era of additives and preservatives, this beard shampoo has no parabens, no sulfates, no synthetic fragrances, no colorants, and no silicones. Therefore, if you have a sensitivity to any of these preservatives, you can go with this beard shampoo. In addition, the price of this shampoo can be termed as mid-range for a beard shampoo and we would recommend it hands down. You will feel less itchy and flaky with its use in no time (probably three to four washes, to be precise!). The only drawback we can say about this otherwise nice beard shampoo for growth and beard care is that the scent wears off rather quickly. However, this in itself I think is well thought out because if you are sensitive to scents, a strong and long-lasting scent close to your nose can cause malaise and headaches. Important Info to Remember: As a black man, the frequency of beard shampoo, unless your beard has been to really dusty surroundings, should be around once a week to avoid your already dry and coarse beard becoming more so. We all know maintaining your beard at a certain length is a continuous struggle because of the constant hair growth. Same is the case if you are switching between styles. Therefore, to avoid you don’t look disheveled and to cater all of your styling demands, you need a beard trimmer. As said earlier, as a black man, you are more than likely to have coarse and curly hair. Therefore, when going about a trimmer, you need to go with the one which is quite efficient at cutting hair. 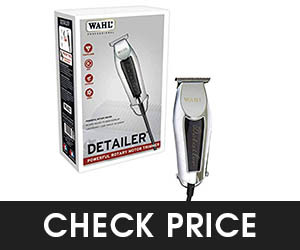 Our pick Wahl Professional Detailer is commercial-grade and would cater all of your styling needs. Because it comes with a rotary motor, it is likely to remain cooler than electromagnetic models and won’t heat up too much. Moreover, it comes with T-blade which gives a precise cut-out. Additionally, this Wahl Detailer comes in an ergonomic design at 5″ and would fit in your hands perfectly and weighs 6.9 oz. The material of construction for this Wahl beard trimmer is hard plastic. But, it has a chrome finish which makes it sturdy enough to last for a while. 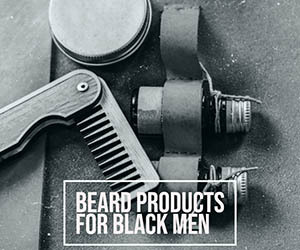 Above all, this beard trimmer for black men has all the styling accessories you can ask for. It includes three comb cutting guides (1/16″, 1/8″, and 1/4″). The package comes with oil, red blade guard, cleaning brush, and operating instructions. However, the thing which you need to be mindful when using Detailer is the T-blade. This is because it is sharp and can cause cuts, so it takes a little bit of getting used to. Overall, this is a beast of a trimmer to have your arsenal. It comes at a price which can be termed as medium range. It lasts really long and provides the precision you need when styling. Tip to Remember: Ingrown hairs are a big worry for black men because of their curly hair. To avoid ingrown hair, sterile you trimmer before using with alcohol or any good sanitizer. There are a lot of benefits of using a beard oil and we can’t write enough about the need for using one. However, as a basic, we would recommend you to remember that facial hairs are different than your head hairs. Therefore, the normal hair oil can’t be used for used for a beard. Since facial hair and beards became a mainstream fashion, the men grooming market has been flooded with a lot of beard care products. Amongst them, men’s beard oil is really a necessity if you have a beard. Additionally, as a black man, using a beard oil is vitally important for a well-nourished well-looking beard. This is because, as said earlier, your hairs are not naturally self-sufficient in oil and you naturally dry hair require extra moisture to stay healthy. We have a whole list of best beard oils for black men for different characteristics and price range. But, if you would ask us to pick one it would be – Mountaineer Beard Oil with Citrus and Spice. Firstly, you are going to like the amount of oil the bottle of Mountaineer Beard Oil has to offer, twice than most beard oil brands. Secondly, it is made up of 100% natural oil and consists of grapeseed oil, almond oil, and castor oil and these to well known to moisturize your hair and skin underneath. Thirdly, it has a citrus and spice scent which it derives from citrus and spice. Its natural and potent ingredients make it best beard oil for growth. Above all, this makes on our list for beard oil for black men as it is going to make you smell like a mountain man who washes with pine and sandalwood. Its all-natural ingredients will moisturize your skin and condition your skin. One of my friends liked it so much, he always has a spare bottle on hand, so he does not run of it ever. 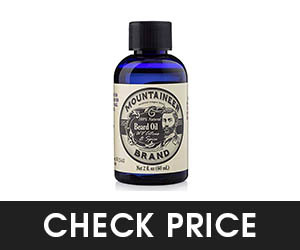 In conclusion of our review for Mountaineer Beard oil, we would like to say this is one of the best affordable beard oil you are going to get in the market. It is best for everyday use, but may not serve extreme dryness or flaking. Important Tip to Remeber: Whichever beard oil you are going for as a black man remember that it should not have comedogenic oils because it will increase your likelihood of getting ingrown hair and blackheads because of these clogs the hair. These include Abyssinian oil, Argan oil, and Avacado oil to name a few. With every beard care product comes the question of why not your ordinary scalp hair product. Same goes with the beard brush. Let me answer this for you, this is because the brush is going to come into contact with your skin and as your facial skin is much softer than your scalp skin, a harder hairbrush is going to damage to your skin. So you need to have a brush which has softer bristles. With that point away, what you should look for beard brush. 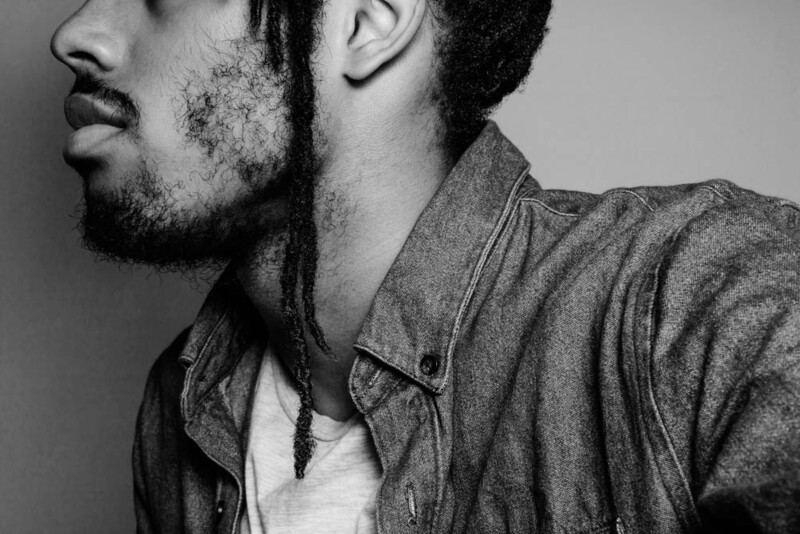 For black men, you need a delicate combination of something that is hard on coarse curly hair to disentangle them and something that does not affect your already soft skin. More than 40% of bearded men admit that food gets stuck in the beard. therefore, a beard brush is an essential grooming tool for cleaning your beard. We searched hard and reviewed quite a few boar bristle beard brushes and frankly, it is hard to go around ZilberHaar beard brush. Why boar bristle brushes – because they are soft and natural. As a vegan, I know what are you thinking, we didn’t leave behind. If are looking for a vegan beard brush, we would recommend you to have a look at this equally good vegan beard brush by Golden Beards. It is made up of natural fibers from a plant that is found in semi-desertic areas of Mexico. 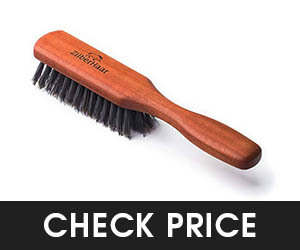 In addition, if you are a Muslim and are looking for a halal beard brush, this can also be a good choice. Anyways, back to beard brush by ZilberHaar. The best about any boar bristle beard brush is that it has an immediate soothing effect on your beard. Additionally, it has all natural material, it has a pearwood handle and body and the 100% boar bristles. Wooden brushes are more durable than plastics and boar bristles are stiffer than hoarse hairs which are not good for coarse and curly black hair. To cut long story short, this beard brush by ZilberHaar does all the stuff you would want a beard brush to do. It provides the perfect balance between being tough on the coarse black skin and easy on the sensitive black skin. Important Tip to Remember: Our skin constantly replaces itself and the older skin needs some help to get rid of. A beard brush helps to exfoliate the skin and activate oil production. In the start, brush your beard every day and after some time like a week or two, you can reduce it to every other day to keep your hair soft and disentangled. Beard balm is still a relatively new thing to beard grooming marketplace. Basically, it is a leave-in moisturizer. Its key ingredients are very much similar to a beard oil with the major difference being that it is mostly used as a styling aid as it holds the hair. Beard balm can have different names like beard butter, beard lotion, beard cream, etc. so don’t get confused about them, they are basically the same thing, just marketed and named differently. Beard balm for black men can be additional moisturizing support. especially if you have a long beard. Additionally, we need to select a beard balm which is soft on the skin. 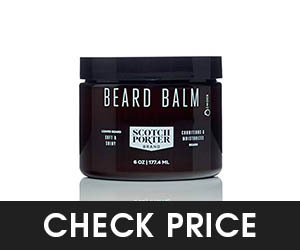 We put a few to test and we would recommend Scotch Porter Beard Balm. This is because it carries no harsh chemical and is really soft on the skin. Moreover, ingredients are all natural and these include marshmallow root which gives its basic scent, slippery elm bark, shea butter, nettle leaf, coconut oil, aloe vera, agave nectar and silk protein among others. In essence, it is rich in hair nutrients like shea butter which provides nice moisture to the hair. Moreover, it has a nice woody manly scent of marshmallow. It gets to work immediately and gives your hair a natural shine and softer looks. Additionally, the thing I really like about Scotch Porter Beard Balm is its buttery and Noxzema type texture. Because most of the beard balms are made up of beeswax, they can have a waxy texture which tends to give a waxy greasy look to the beard. 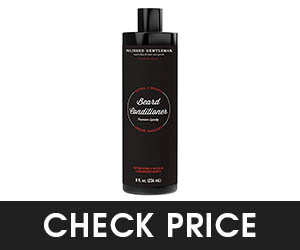 With its buttery texture, it makes the beard feel softer straightaway. However, because it is not very waxy, it does not hold the flyaways as efficiently as you would like. So, as it does not hold very nicely, we would not recommend it basically as a styling or holding balm. Important Tip To Remember: Make sure you dry off all water from your beard before applying balm. This will help with even distribution of beard and will give a solid hold. Typical ingredients of beard wax include beeswax, scented oils, coconut or shea butter. I know what you are thinking, these are the basic ingredients of a beard balm. So, what makes a beard wax different from a beard balm in terms of ingredients, it is the concentration of these ingredients. Essentially, in a beard wax, beeswax is in much higher concentration as compared to beard balm. This, in turn, gives a stronger hold as compared to a beard balm. More to this beard balm vs beard wax later. First of all, when going for beard wax for black men, you need to go with such a beard wax that is all natural or mostly natural because this will be good for your hair in the long run. A chemical-rich or synthetic beard wax may give a stronger hold, but it will dry your hair and skin. We selected Honest Amish Original Beard Wax on our list for best beard wax for black men. Honest Amish is a real name in beard care products. One of my friends has a whole range of beard care products from them and he just loves them. Essentially, they claim to make all of their products by hand from scratch and advertise them to be 100% organic and we can’t really deny the fact that they are one of the top-notch beard care product line. 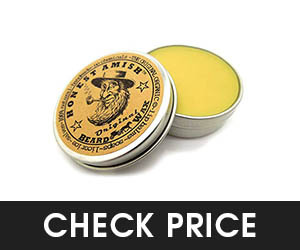 When it comes Honest Amish’s beard wax, they claim it to be the oldest beard wax recipe around. Honest Amish does not disclose the full list of ingredients but claims it to be made up of locally harvested beeswax and has a nice combination of organic oils and kinds of butter. Moreover, it comes in a 100% recyclable 2-ounce tin that is fully biodegradable. Additionally, it has a light natural masculine scent, more like peanuts. It does its job of holding the beard nicely and conditions and soothes the hair. In conclusion, this is a really quality product at a reasonable price and don’t be surprised if you find yourself hooked to its use and you have tin after tin lined up in your cart, its that good a product. Important Tip To Remember: Apply a beard wax to a damp beard. It will spread out easily and disappear quickly into your hair that way. So, what is actually to this beard wax vs beard balm thing. As stated earlier, beard wax and beard balm are made up of essentially same ingredients of beeswax, scented oils, and coconut or shea butter. But, the difference comes in the concentration of each. Beard waxes generally have a higher concentration of beeswax which in turn gives it its characteristic sculpting and holding power. Secondly, the consistency of beard wax is much thicker or denser than the beard balms. Balms have a creamy or buttery texture. Thirdly, waxes are generally considered to be harsher on the skin as compared to blams which are soft on the skin. If you love something, you need to cater all of its needs no matter how minute they may be. Same goes for a beard. On your road to growing a masterpiece of beard, there are a lot of hitches and stutters, and one of them is the split ends. They are a pain and are bound to happen after a couple of months. So, which tool you would prefer to have at hand when they eventually come up; a scissor. Secondly, as a black man, you are more than likely to have curly hair, and unless you embrace the curly look to your beard, you are going to need to a constant trimming of the ends to give a straighter look. They are still the preferred tool for professionals and not without reason. They are more precise and easy to maneuver. 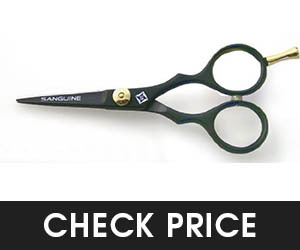 With all of these whys, we went about selecting a beard scissor for black men and we found this pair of scissors from Sanguine. Whenever going for beard scissors, you need to consider two factors: the size and the material. Both factors are independent of each other. For beard and mustache, you need scissor of smaller size. Currently, there are two types of steel widely used in manufacturing scissors; Japanese and German. Both of them differ in terms of sharpness and durability. Japanese steel is more refined, but it dulls quite quickly. German steel scissors, on the other hand, have thicker plates but have a beveled surface. Our pick is made up from hand-crafted Japanese steel; which in itself is enough to say about its quality and durability. It has an ever-decent black design and has a length of 5.5″ (14 cm). However, it has a smaller model which comes at 5″ (12.7 cm). The price may be on the higher side when compared to other scissors in the market, but it is highly durable and would stay sharp for months. Important Tip to Remember: Always use a comb when trimming your beard. Try to reach your desired length in a few steps rather than just going in one go, it will give you a better idea of how much exactly you need to take off. If you are a beard lover and have been growing beard for a while now, you would know what different purposes are served by a beard comb and a beard brush. For our readers, who are new to beard growing and are a little confused about it, here it is why you need a beard comb along with a beard brush. First of all, you would need comb when you are cutting those split ends and are lining your beard up. Secondly, brushes are good for small and medium beard lengths, but if you have a full-fledged unruly beard, it becomes difficult to manage with a brush and you would need a comb. In short, a beard comb is necessary as any other beard care product and if you are a keen bearder, you probably know it by now. So, coming back to our main purpose of this post; best beard care products for black men and now we would be talking about best beard comb for black men. So, what things you need to consider when buying a beard comb; I would keep it short, promise. There are basically two things to consider when buying a beard comb; teeth width and the material of construction. Firstly, in terms of teeth width, if you have softer hair a comb with narrowly spaced teeth would serve you well. On the other hand, best beard comb for curly or coarse hair would be one that has wider teeth because it will glide easily through dense curly hair than close-spaced teeth. Secondly, in terms of material of construction, beard combs are a made up of a variety of materials ranging from plastic and wood to metal and rubber or cellulose acetate. There are pros and cons for each one; plastic ones are cheap but breakdown easily, metal combs are durable but are not anti-static and their sharp edges can damage hair follicles. This leaves us with wooden and cellulose acetate ones, these two are considered best for beards because they are mostly anti-static and are softer on the skin. 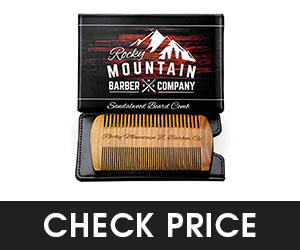 So, we had to pick one for our list and we considered quite a few things and we went with a sandalwood beard comb from Rocky Mountain Barber Company. When you have this amazing comb in your hands or in front of your eyes, the first thing you are going to notice is its eye-catching design and alluring look. It is made up of smoked sandalwood, which gives it an amazing appearance and smell. Additionally, what I really like about this comb is that it has different teeth spacing on each side. On one side, it has fine teeth spacing and on the other side, it has widely spaced teeth. Therefore, this characteristic allows it to serve a wide variety of users. It reaches base without ripping or snagging your beard. Moreover, it comes at a price which can be termed as mid-range for wooden beard combs, but they have not cut any corners on quality; it is a perfectly crafted masterpiece. Above all, it is anti-static, unlike plastic beard combs. Another fact to love this comb is that it comes in a velvet-lined box which looks really decent. In essence, we have only good things to say about this truly amazing beard comb because it caters a wide variety of users and is soft on your skin and beard. So, do I have to answer all of your doubts again about this beard care product too, and can I just go by saying that it has different functions and serves your beard in a different way than oil or a beard balm? No? ok! so let’s start with “why beard softener when you can use oil for the same purpose or beard softener vs beard oil”, this is because a beard conditioner or softener is more potent than oil and it will serve your beard as it will act as a conditioner and will coat your beard so even if you rinse it out, it will still be soft after its application. Secondly, because of its ingredients, it will provide a bit of hold, so if you have fly-aways and stray strands, a softener will keep that hair in place. To make matters a little bit easier in terms of functionality of a softener, they are midway between a beard oil and a beard wax. They nourish your hair like a beard oil and they hold your beard like a beard wax, not quite so, but still, they do hold those strays in place, like said earlier. Hopefully, this is enough to explain the functionality of a beard conditioner/softener and also because if you are a bearded man you would already know about different uses of different beard care products. Moreover, as black men have curly and dry hair texture having an additional softening product become more needed. Like any other product, there are a lot of beard softeners/conditioners in the market but we decided to go with Polished Gentleman Beard Growth and Thickening Conditioner. The thing I really like about Polished Gentleman conditioner is that it is made up of all organic ingredients and it smells great. Additionally, it comes in three bottle sizes of 4, 8 and 16 oz. First of all, you are going to notice after using this conditioner is that your beard will feel as soft as a butter. It will comb easily and your lady will love touching and kissing it. It also comes in a combo with Polished Gentleman Shampoo which I think is a great convenience. In terms of ingredients; it is made up of natural and organic products and is not harsh on your skin at all. Amongst its ingredients is biotin which is an essential nutrient for hair growth and is found in many hair care products. So, if you have a patchy beard or have problems with hair thinning, this conditioner can help fight these problems. Other ingredients include argan oil, glycerine, vitamin B5, Niacinamide, aloe vera, and others. Additionally, it includes manuka honey, which is known for its antibacterial and antifungal properties, so it would keep dandruff away. Moreover, it also includes eucalyptus oil, which promotes hair growth and gives hair a shiny look. Amongst its other features includes the fact that it is free of artificial fragrance, sulfates, alcohol, and paraben. It is free of gluten and is safe for all skin types. Additionally, it is pH balanced and can be used daily. In essence, there are a lot of good things to say about this nice affordable beard conditioner/softener. The only issue I could state would be that it does not hold as efficiently as you would expect from a beard conditioner, otherwise, it is worth every penny of its cost. Growing a beard is in fashion but like other body parts it requires attention and taken care of. The daunting process of a growing beard comes with a number of skin and hair problems and this, in turn, can discourage people and they can forget their dream of an iconic beard. Amongst black man beard problems include patchy beard, dry itchy skin and beard, itchy beard and the dilemma of which beard products to use as a black man. We will try to explain each of them in a little more detail and what you can do for their solutions. When it comes to African-American beard grooming, the most common problem is the patchy hair or beard. This essentially means you may have facial hair in one area and not much in others. This in turns gives a disheveled and unruly look to your beard. A patchy beard is mostly due to genetics and you can’t really help it other than providing essential nutrients for beard growth and hoping it will turn up great. One way is to accept and embrace the patchy beard. There are a lot of sportsmen and singers who have come out with their patchy beard without shame like Black-Eyed Peas. However, if you want to get rid of the patchy beard, you can add some additional nutrients to your diet and take multivitamins or proteins. One of the major nutrient essential for hair growth is biotin, which is also essential for nails and skin. Secondly, protein is necessary for hair growth and you can add some animal and plant protein to your routine like this one. They work great and can help you with other health conditions like arthritis or weight gain. Lastly, patchy can be as a result of lack of testosterone. This can be the cause of your patchy beard or hair thinning especially if you are getting on the wrong side of youth. So, adding a testosterone booster like this can help you with this problem. But, ensure to you get your level testosterone checked and use it according to your doctor’s instructions. Our skin constantly regenerates itself and it needs to get rid of old skin. Our normal skin loses its dead cells during washing. However, when you are going a beard, your normal wash is not able to reach the skin underneath and the dead skin can result in itching and flaking. The solution to this problem is the exfoliation of the skin. This can be done by some of the products we mentioned like a beard shampoo or beard oil if massaged thoroughly frequently like once a week. Similarly, you can use a facial scrub like this one. This will exfoliate your skin and reduce inflammation resulting in less itching and flaking. We had a detailed look at many different beard products that are great for black men and their skin and hair needs. Hopefully, the detailed informative list will help you decide better on this front. In general, black men have curly and coarse hair as opposed to white or Asian men. In addition, they also have skin which is more sensitive. So, we need to pick up products which are suitable for our skin and hair types. As beard care products are relatively new to the marketplace, we need to be extra diligent about selecting one and this is a complete science of how skin and hair products work on our bodies and which ones we should go with. In essence, we tried to pick one product from each beard care product lineages which we believe would cater beard care needs of black males. We mentioned nine products, some of them are essential needs like shampoo or beard oil and others are an extra treat for your beards like a beard softener. In addition to these products, there are some bread grooming kits which include most if not all of these products. One of beard grooming kit is Maison Lambert Beard Kit which comes in a beautiful cigar box and is made up of organic ingredients. Hopefully, this will information will serve you well. However, if you any confusion or question in mind, don’t hesitate to post your queries and we would be happy to respond.